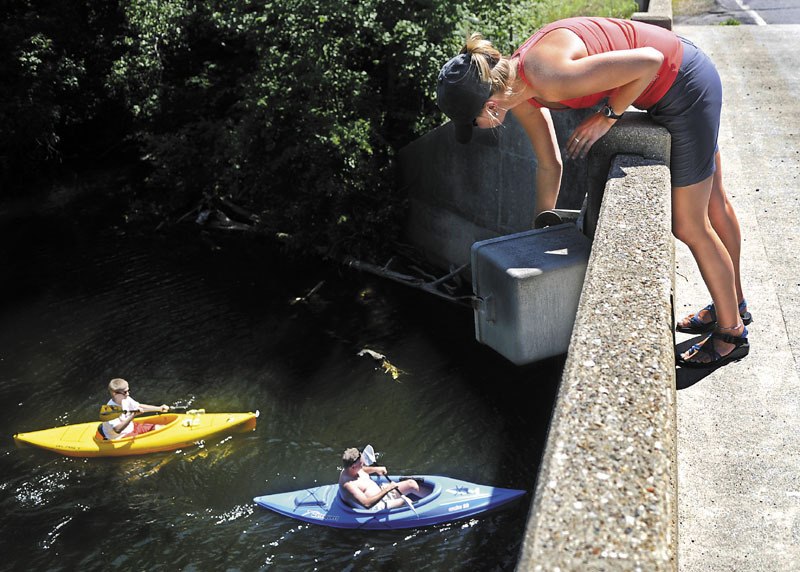 Cobbossee Watershed District intern Hannah Shute checks the gauge Thursday that measures the level of Annabessacook Lake in Monmouth as kayakers paddle beneath the bridge spanning it. Cobbossee Watershed District intern Hannah Shute checks the gauge Thursday that measures the level of Annabessacook Lake in Monmouth as kayakers paddle beneath the bridge spanning it. The district is responsible for managing water levels and quality in the 28 ponds and lakes of the watershed. Shute, a student at the University of Southern Maine, is working for the district for the summer.